The =AVG=Dedicated server is currently running the Wings~of~War: North Africa 1943 campaign in IL-2 Sturmovik: 1946 version 4.13.4m. With our down & dirty guide to all things IL-2 Sturmovik: 1946, you can get to 4.12.2m in only 5 patches from your disk (4.07m) and then add HSFX 7.0.3. You can get to 4.13.4m from the disk in just 10 patches, and all of the links in our nifty patching guide work. I've just added the 4.10.1m Mega Patch so you can skip the first 5 steps, and also added the No CD Patch to get you up and running IL-2 Sturmovik: 1946 as quickly as possible. 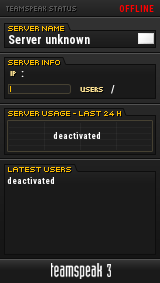 Views are now allowed on the =AVG=Dedicated server. The server is currently running Wings~of~War campaigns in-IL-2 Sturmovik: 1946 4.13.4m. You can upgrade to IL-2 Sturmovik: 1946 4.13.4m below.